Call 518-243-8371 to schedule your first appointment. When you rely on Miracle-Ear® for your hearing aids in Johnstown, NY, you’ll be able to discover and experience the Miracle-Ear advantage. We’ve been assisting customers like you for more than 70 years, and our hearing care specialists will provide you with the premium service you expect from the industry leader. Our products feature the latest technology, which can wirelessly connect to cellphones and other devices and allow you to control your hearing aid with the touch of an app* on your smartphone. Our new GENIUS™ Technology can improve your speech recognition, help you focus on the main point of sound, and allow you to hear clear, rich sounds. 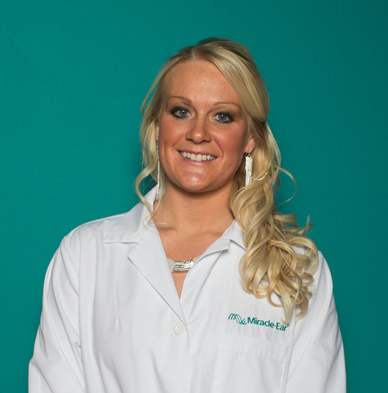 Nicole has five years of experience working with Miracle-Ear as a Hearing Aid Specialist. Nicole is a New York State licensed hearing aid dispenser. She is also a Miracle-Ear certified Hearing Care Professional. Nicole's favorite part of working at Miracle-Ear is that she gets to help better people's quality of life.